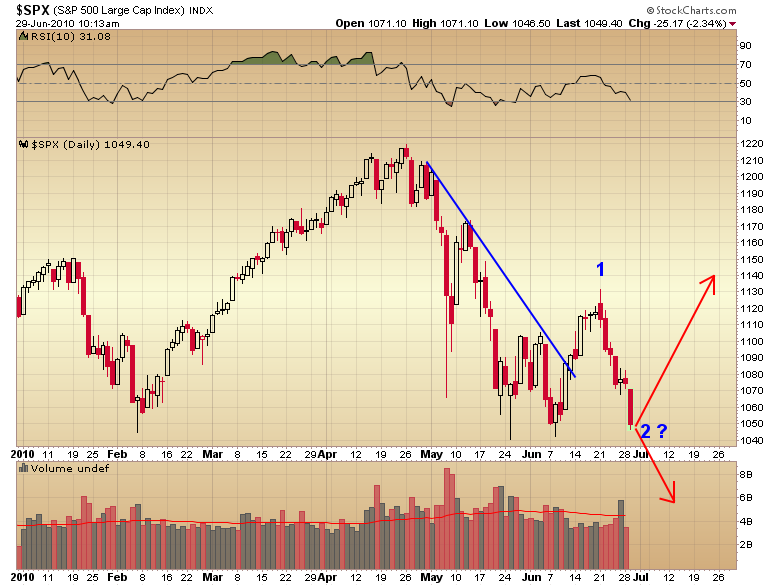 The S&P may be in the process of forming a 1-2-3 reversal. It broke the down trend line during the recent rally and is now in the process of testing support. For you trader types this is the lowest risk entry on the long side. You could place stops slightly below the previous lows at 1040 and risk less than 2% on the trade. If the market does hold support and rally from here your risk reward ratio would be very large. There are large momentum divergences forming in RSI and and MACD. Hint: The least risky trade is to buy below support. If you end up being wrong your risk is even less than 2% and you may catch the bottom of a 2b reversal. This entry was posted in Uncategorized on June 29, 2010 by Gary. If you are one of those people who absolutely loath ever taking a draw down then you might want to wait a bit before jumping in with both feet. Gold is due for a daily cycle low any time now. It is possible that the low formed last Wednesday. I would like to see a more decisive decline to mark a cycle low though. If you are a long term “OldTurkey” type investor just ignore the daily cycles. But if you are still trying to enter positions with as minimal draw down as possible you might wait a bit and see if gold experiences a larger drop this week into a more normal daily cycle low. This entry was posted in Uncategorized on June 28, 2010 by Gary. Question: How will we know when the bear has returned? Well, for one, the market will break back below a yearly cycle low initiating a series of lower lows and lower highs. This year that cycle low was set in February. But didn’t the market break that low during the recent correction? Well yes and no! 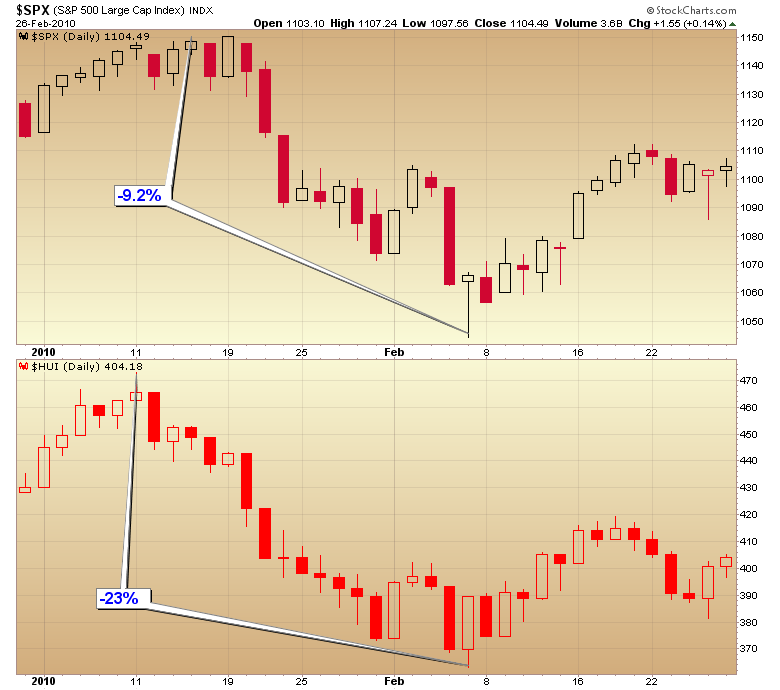 The S&P and Dow did both marginally break below the February lows. However a big part of the weakness that dragged these two indexes down was due to crumbling energy stocks as the mess in the gulf unfolded. The rest of the market held above the February lows. Some like the transports comfortably above those levels. I tend to think if the economy was ready to fall back into recession again we would be seeing a lot more weakness in the trannies. The banking industry has also held up quite well during the recent crisis. Surprising since it was the failing European financial sector that has been blamed for the current market swoon. If the financial sector is collapsing again how come the banks are holding above the February lows? So we are kind of up in the air right now on whether we are indeed making lower lows. Then the final straw would be for the 50 day exponential moving average to cross back below the 200 and for the 200 to turn back down. Obviously none of these things have happened yet. Until they do it’s just too early to get beared up. This entry was posted in Uncategorized on June 23, 2010 by Gary. 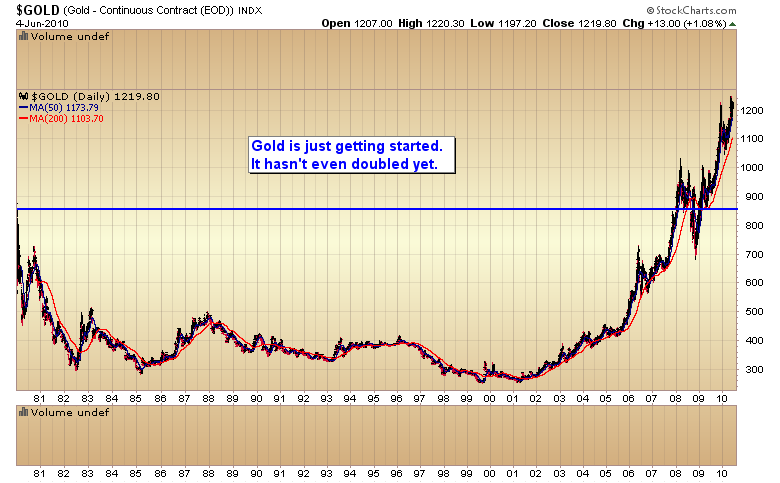 We continue to hear pundits describe gold as a bubble. Certainly it will turn into a bubble before this is all over but we are hardly in the bubble stage yet. In order for a bubble to form you need the public to come into an asset class. The public is pretty dim and it can take 15-20 years before they “catch on”. It took 18 before they noticed the tech bubble. Once they do start to “get it” we will have about a year to a year and a half as gold enters the parabolic stage before the bubble pops. 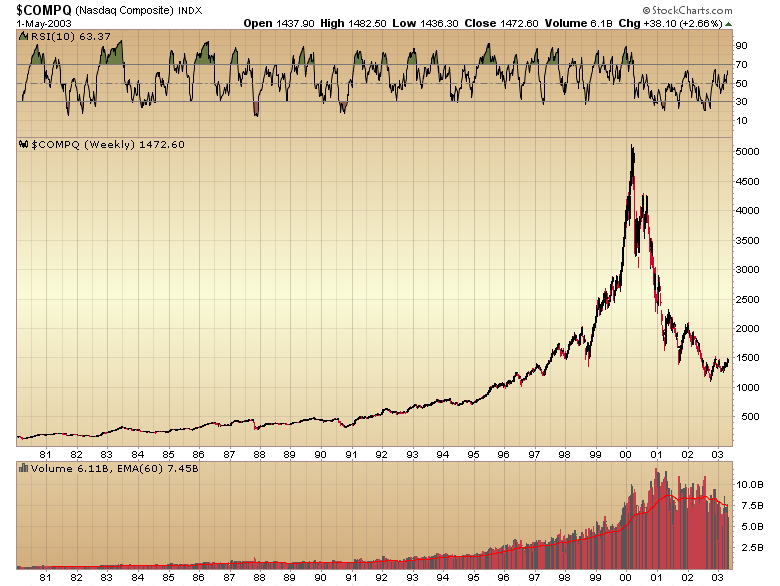 See the Nasdaq chart below from late 98 to March of 2000. At gold’s top, half of your neighbors will be buying gold (not selling like they are doing now). At the top there will be lines outside the the local coin dealer waiting for the next shipment of gold to come in. At the top 7 of 10 billboards you see driving down the highway will have something to do with precious metals. At the top the guy standing next to you in the grocery store will tell you how many thousands of dollars he made last month off his gold coins. At the top everyone will have become convinced the dollar is toilet paper and will only continue to decline until it has become worthless. At the top the population will believe that we have to go back on a gold standard. By the way, a gold standard never stopped any country from debasing its currency. In ancient Rome they clipped some of the gold out of the coins. Roosevelt confiscated and arbitrarily revalued gold in the 30’s. A gold standard will not prevent a government from trying to get something for nothing by debasing the currency. At the top stocks will be universally hated and gold universally loved. In reality, stocks will at that time, represent true value. Much more so than a shiny metal with virtually no industrial uses. At the top smart money will eventually come to their senses and realize that true value (profitable companies making the necessities for life on Earth) are being given away for pennies on the dollar to purchase a shiny metal that really has no intrinsic value. 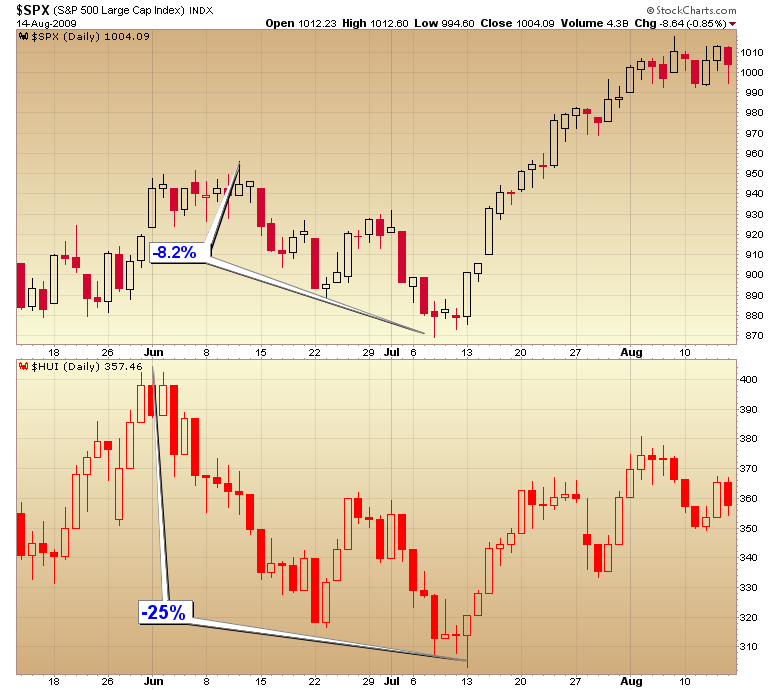 Here is a chart of the Nasdaq followed by a chart of gold. You tell me, does gold look like a bubble yet? I think we might be getting close to the Nasdaq 1998 level, but gold is hardly in the runaway parabolic stage where it rallies over 100% in a year. Not to mention that none of the other signs I noted above are even remotely present yet. But no one needs to worry about a bubble just yet. We need to have at least one more serious correction similar to what happened in `08 or in tech stocks in 1998 to wash out bullish sentiment before we can start the final parabolic run into a true bubble top. If I had to guess I would say that will occur during the next liquidation event which should be due in mid to late 2012 as the stock market collapses down into the third leg of the secular bear market. That should mark the next four year cycle low and possibly the nominal bottom for the secular bear market in stocks that began in March of 2000. I expect the selling pressure at that climactic event will also drag gold down into the correction that should separate the second phase (what gold has been in since early ’06) from the third and final bubble stage. Gold will quickly recover, like it did from the last selling climax, and when it does this is when we will see the public begin to panic into gold. Then and only then can we start talking about a bubble. At the moment I think we are about to enter the second leg of an ongoing C-wave advance that began in September of last year. I’m expecting this leg to take gold to the $1400-$1500 level before experiencing a major D-wave correction. I’ll be monitoring the advance on a daily basis to keep subscribers appraised of where gold is in its intermediate cycle. When I think we are getting close to the top of the C-wave I’ll warn subscribers to take profits and exit the precious metals market so as not to get caught in a D-wave correction. This entry was posted in Uncategorized on June 20, 2010 by Gary. 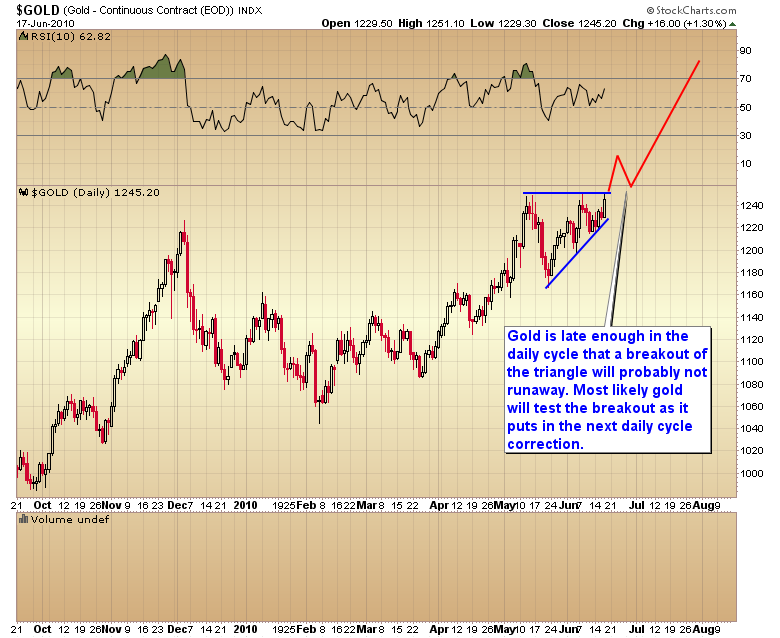 We may see gold breakout of the triangle consolidation today. However I don’t think one should expect gold to just “runaway”. It is late enough in the daily cycle that we have a short term correction coming due soon. It’s probably more likely that gold breaks out, then re-tests the breakout level at $1250. I’ll have more in the weekend report of what I think is unfolding in the precious metals markets. This entry was posted in Uncategorized on June 18, 2010 by Gary. I was going to post part of tonight’s report to the blog but decided I didn’t want to go through the hassle of transferring it over. So I just unlocked it on the premium website. If you want to read the report just click on the link to the right and it will take you to the subscriber website. This entry was posted in Uncategorized on June 17, 2010 by Gary. During the recent correction miners underwent a significant change of character. I’ve mentioned many times in the past that the selling pressure at intermediate cycle lows tends to pull everything down with it. That always includes the miners. Mining stocks are notoriously volatile and gold bugs are probably the single most nervous group of investors on the planet. So it’s not unusually to see the HUI drop 20-25% during an intermediate level correction in the stock market. You can see that during the first two intermediate degree corrections we’ve had since this bull market started, miners followed that pattern to a T as panicky gold bugs fled the sector in droves. During this latest intermediate term correction something changed though. During the first stage of the correction the mining sector could have cared less what was happening in the stock market. 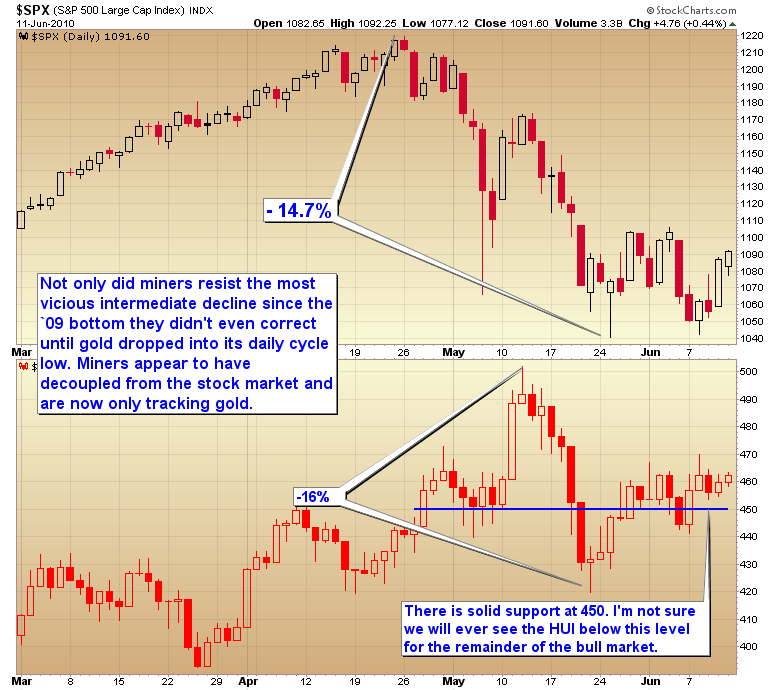 During the first two weeks of the correction while the market was in crash mode miners actually rallied over 14%. 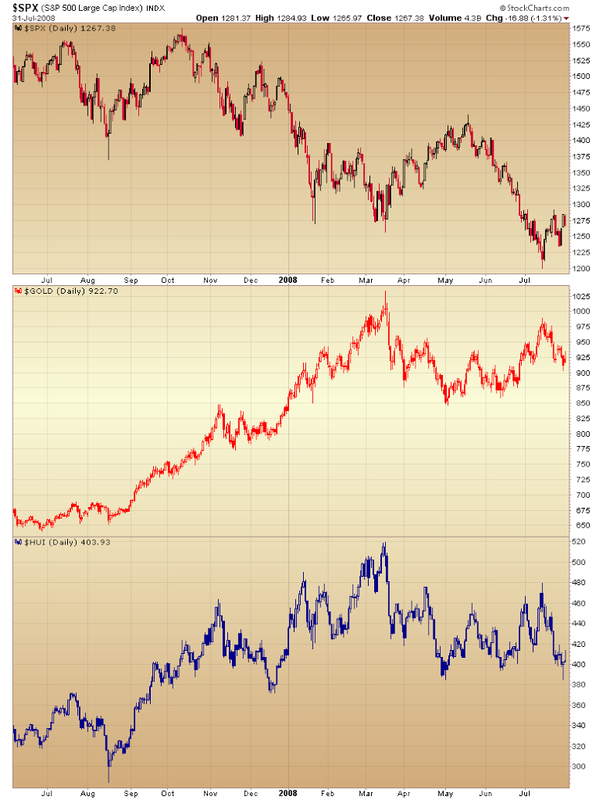 Miners, like gold had completely decoupled from the stock market. It wasn’t until gold put in it’s smaller daily cycle correction that the miners pulled back at all and even then it was only a mild 16% pullback. Pretty impressive action considering the stock market was still experiencing severe selling pressure at the time. It’s apparent that miners have now moved into strong hands. Hands that aren’t going to sell at every little wiggle in the market. Hands that are going to scoop up the shares that flighty retail investors are foolish enough to let go of. This entry was posted in Uncategorized on June 14, 2010 by Gary. We’ve been following the Dow:gold ratio for quite a while. I’ve been saying for years that we will eventually see the ratio move to par by the time this bull is finished. Actually we may even see gold briefly become more expensive than stocks. You can see from the above chart each swing since the 30’s has been more extreme than the last on both the up and down side. The extreme undervaluation of gold and overvaluation of stocks in 2000 will probably lead to an even larger swing down as the long term cycle moves back to the opposite extreme. I expect human emotions to work their magic and ultimately we will probably see gold briefly become more expensive than the industrials at a bubble top some time in the future. At the moment the Dow:gold ratio may be poised for another leg down after the year and a half consolidation. As you can see these big consolidations eventually lead to another leg down in the ratio. 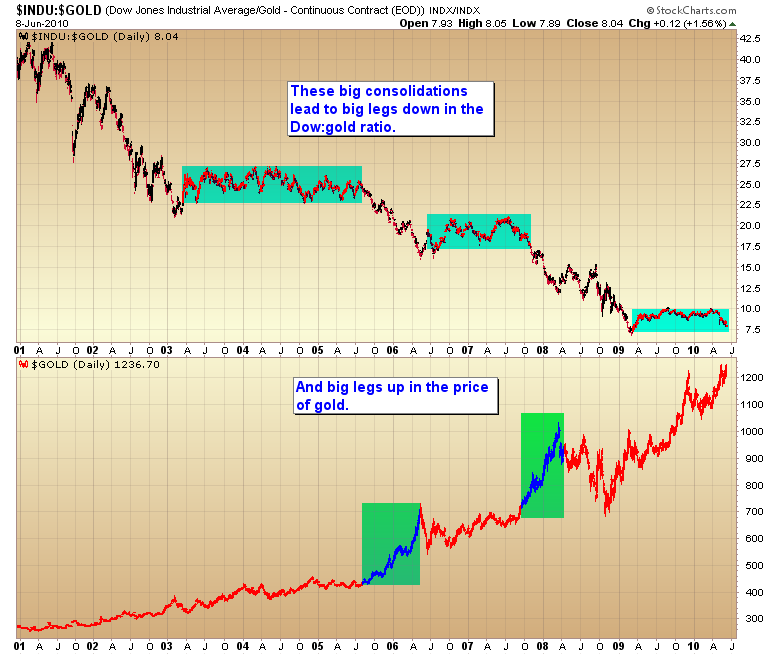 Once the consolidation completes we get another repricing of stocks compared to gold. Usually that means a big rally in gold although the last leg down included not only a big move higher in gold but also a drastic downward price adjustment in stocks. By the time stocks finished the bear market leg gold had established a new value zone between $1000 and the old 1980 high of $850. Then for almost a year and a half stocks rallied while gold consolidated that big move, eventually even broadening the range up to $1250. Now gold is poised for another major leg up while stocks are stuck either in a consolidation of the big rally or maybe even another leg down in the secular bear. Either way, I think once the Dow:gold ratio breaks below the bottom of that range we will be heading into another major repricing of stocks compared to gold. This entry was posted in Uncategorized on June 9, 2010 by Gary. It’s sad to say but I’m afraid 90/95% of all retail traders/investors are not going to successfully ride the gold bull. The reason of course is that they are deathly afraid of draw downs. It’s glaringly apparent every time gold pulls back or suffers the slightest correction. Immediately a slew of traders come on the blog and warn of impending doom. “Gold is going to $600” (think Elliot wave). Some are even brave (maybe I should say ‘foolish’) enough to short. 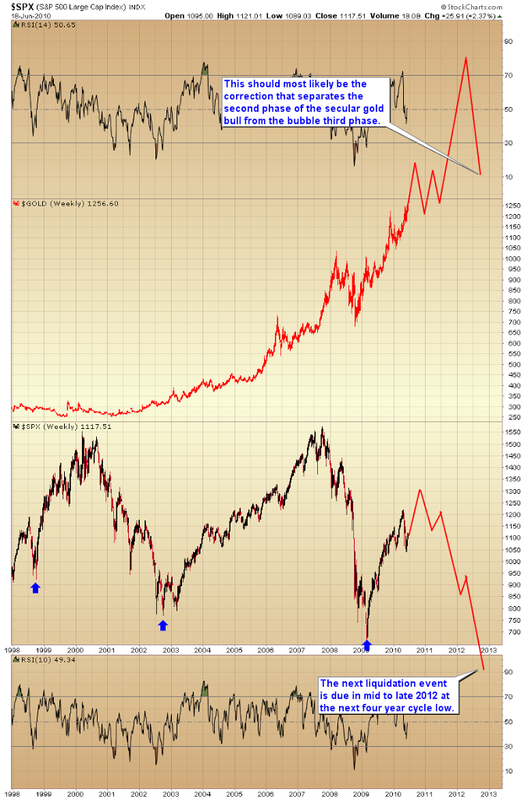 Here is one we hear alot lately, “miners are going to get crushed if the stock market enters a new leg down in the secular bear market”. Let me show you what happened to gold and miners during the 2000-2003 bear market. 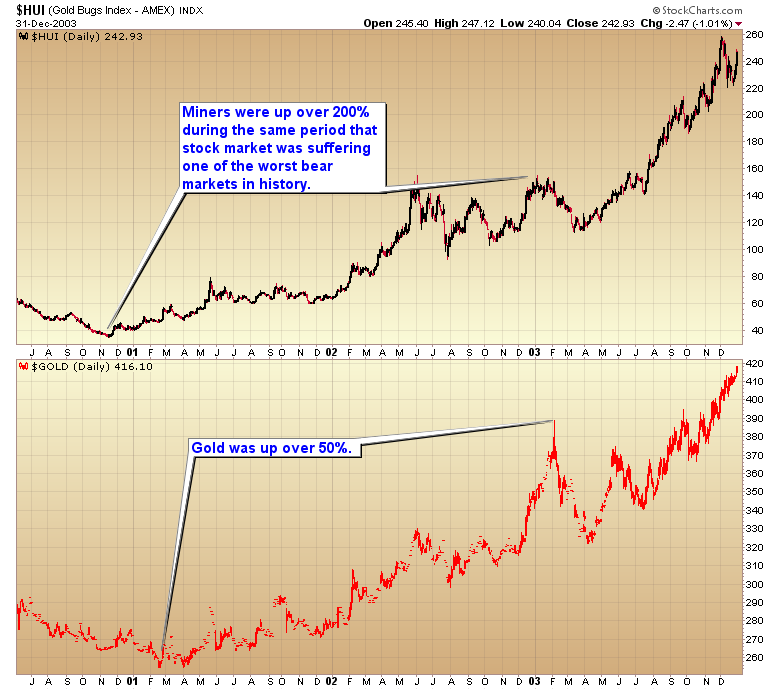 During one of the worst bear markets in history gold rallied over 50% and miners well over 200%. So this notion that the precious metals sector has to get hit during a bear market is simply ludicrous. Now I know what you are going to say, “just look at what happened in `08”. The reality is that the crash in `08 was a very special set of circumstances that aren’t likely to repeat. Up until September the bear market was following the normal path most bear markets follow. Slow grinding declines followed by explosive counter trend rallies. Gold was holding up amazingly well during this period as were miners. Both were actually up significantly during the first 5 months of the stock market bear. 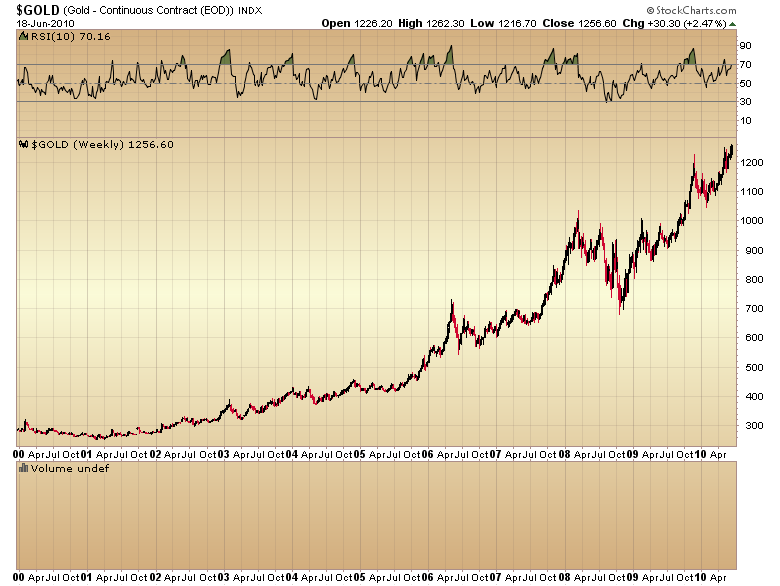 It wasn’t until gold entered a normal D-wave correction in March of `08 that either corrected at all. In September a rare event happened that drastically changed the entire fundamental picture of the bear market. At that time roughly $700 billion in debt came due. The financial system needed to roll that debt over but couldn’t as the credit bubble was in the process of imploding. That led to one of the few true stock market crashes in history. The ensuing panic led to a selling climax in every asset class even including, to some extent, gold. The actual price of physical gold never even came close to dropping to the levels of the paper market. Smart money investors were taking advantage of the irrational selling by buying up every single available oz. of physical gold on the market. At the time premiums on physical were over $100 above the paper price. The point I’m trying to get across is it took a very special set of circumstances to create the kind of selling climax that could take down the precious metals sector. Those circumstances are not present today. The EU has already gone to the printing press to halt their debt problems. The US has done away with the mark to market rules and Ben stands ready to print so we have no looming debt crisis in our future. So if we are about to enter another leg down in the secular stock market bear the odds are it will be another slow grinding affair, very similar to the 2000-2003 bear. There will be plenty of sharp counter trend rallies and one can bank on the Fed throwing more and more trillions of freshly printed dollars at the problem all along the way. And that my friends is the fundamental bedrock of the gold bull. Now let me show you a long term chart of the last great secular bull market. This is just about text book for a big secular bull market. We see a very extended period of consolidation below a key resistance level. Eventually that resistance level gets broken. Once it does it’s like a damn breaking, the force then becomes unstoppable, ultimately reaching heights far beyond what anyone can foresee at the original break out. In oil’s case the secular bull rallied almost 300% above the $40 breakout level, topping out with a massive parabolic move lasting about a year and a half (remember me saying bubbles tend to last about 1 to 1 1/2 years as the final phase tops out?). 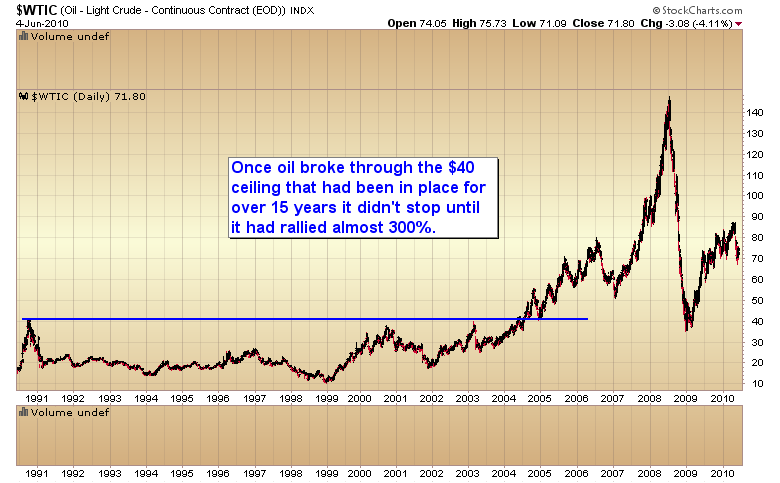 I want to point out this happened in oil, a commodity that was virtually impossible for the average Joe to invest in. This was a bubble driven purely by the investing community. Remember this because it’s important. Now let’s take a look at the next secular bull, one that’s still in the baby stage. Gold has just recently broken out above the old 1980 high of $850. It hasn’t even doubled yet much less rallied 300%. Now if you think gold rallying to $3500 is ridiculous you are absolutely correct. There is no way gold is going to stop at a mere 300%. Unlike oil, gold is readily available to the public and ultimately that is what drives the final stages of a secular bull market/bubble. When the public comes into the market their panic buying drives the final parabolic move to unbelievable heights. We saw perfect examples with both the tech and housing bubbles. The public was deeply involved in both. And now, for the topping on the cake. The precious metals markets are infinitely smaller than the stock market, real estate markets or energy market. That means it won’t take anywhere near as much money to drive these markets to incredible heights. Look at that chart of oil again. A 300% gain in a very large liquid market without ever drawing in any perceptible buying from the general public. Now look at that chart of gold again, only this time with fresh eyes. The possibilities are simply staggering. I wasn’t kidding when I said this will be the greatest bull market any of us will ever see in our lifetime. If, and this is a big if, you can ignore the nonsense from the Nervous Nellies or the gold Bears (a breed destined for extinction) and just hold on to your positions you will ultimately reap unimaginable rewards as this bull progresses. Now I will say that yes, there are times to take profits in bull markets. 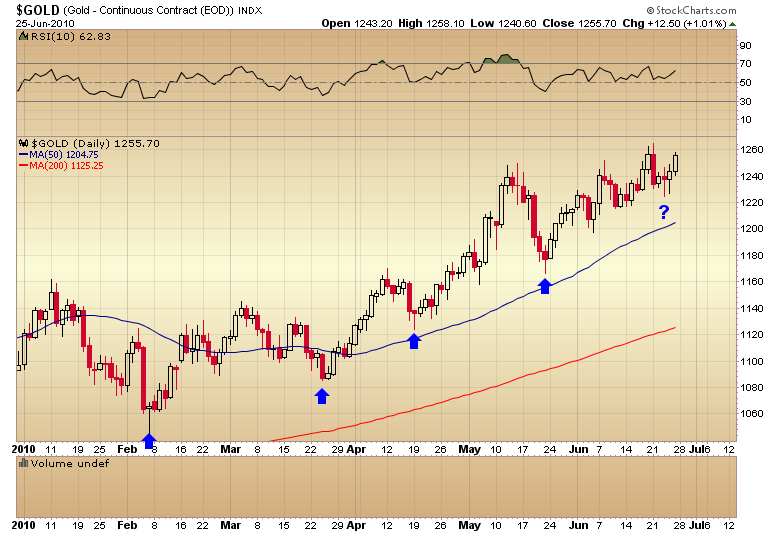 You take profits when gold and miners are stretched far above the 200 day moving average. Everything eventually regresses to the mean. So when we see the HUI 40-55% above the 200 DMA then yes, you should think about selling at least some portion of your positions. But to sell positions with the miners 3% above the 200 DMA is … well, it’s just plain dumb. This isn’t the time to sell it’s time to buy, buy, buy. Let me say this as plain as possible. If you want to get rich from this, the largest bull market you are ever going to see, you don’t listen to the traders and you certainly don’t adopt their flawed strategies. You simply can’t think like that if you want to ride this bull. You need to think like a value investor. When you see value you scoop it up no questions asked. And if the market is foolish enough to give you an even better bargain down the road you buy more. Unfortunately here is what happens. Retail investors are unable to buy value. For the average retail investor to buy he needs emotional confirmation. I see this all the time. “Wait till the breakout for confirmation before buying.” The problem with that approach is that most breakouts soon fail. If one waited for the recent breakout above $1225 to buy they then had to weather an immediate draw down. I saw this in spades at the December top. Retail traders entered in droves during that time. They were getting the emotional confirmation they needed. Then when gold corrected they either got knocked out for a loss or they held on just long enough to get out even. Most simply don’t have the patience to ride the bull on his terms. They want the bull to do what they want, when they want. I suspect more investors have been lost to boredom that draw downs. The best strategy right now is to just sit tight. Remember this is still just a baby bull and it has a long long way to go yet. This entry was posted in Uncategorized on June 6, 2010 by Gary. I have to wonder, are we entering the ending phase of this cyclical bull? For sometime now I’ve noticed the similarities between the `02-`07 cyclical bull and what we’ve experienced since March of last year. The one difference is that this time we’ve truncated the middle phase of the bull. I suspect that was a direct result of the massive liquidity Bernanke … and all central banks have pumped into the system. Both bulls exhibited powerful moves out of the bottom followed by a 9% correction separating the second leg from the third. In the `02 – `07 bull we then entered a 2 year phase were the market ground higher. That phase is missing from the current bull. 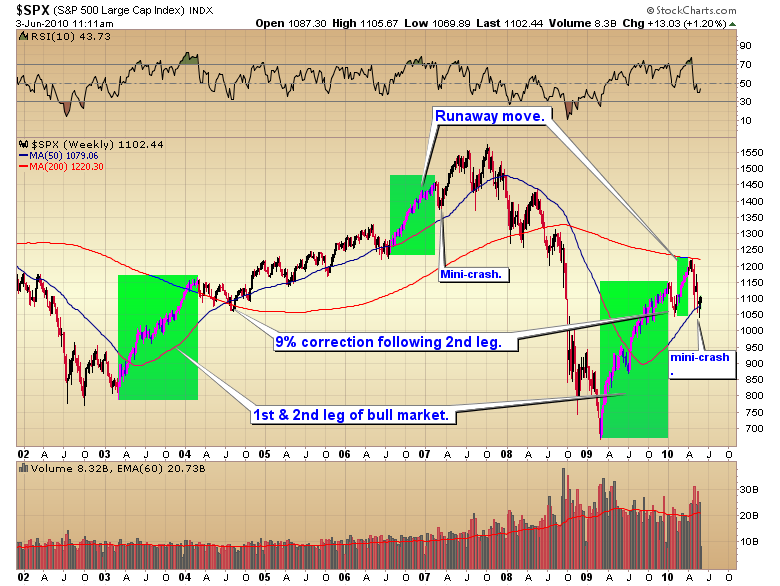 What followed the `06 correction was a powerful runaway move into the February `07 top. That persistent rally skewed sentiment extremely bullish at the time. We saw the exact same thing develop as the market entered the runaway move out of the February 5th bottom. At it’s peak sentiment had reached bullish levels exceeding what we saw at the top of the last bull market in the fall of `07. In `07 the runaway move led to investor complacency and severely depressed put buying. The same thing happened at the recent top in April. Investors became terribly complacent. Protective put purchase fell off the chart. The market had no safety net under it. In that condition it was at risk for a crash if investors all tried to head for the door at the same time. They did, and we suffered a mini-crash in the spring of `07 and again in May. 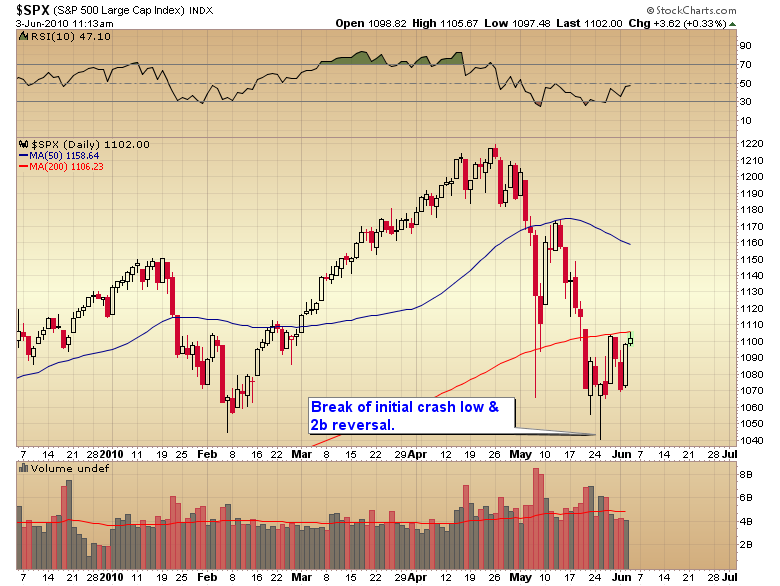 In `07 the initial crash low was tested and broken followed by a 2b reversal. 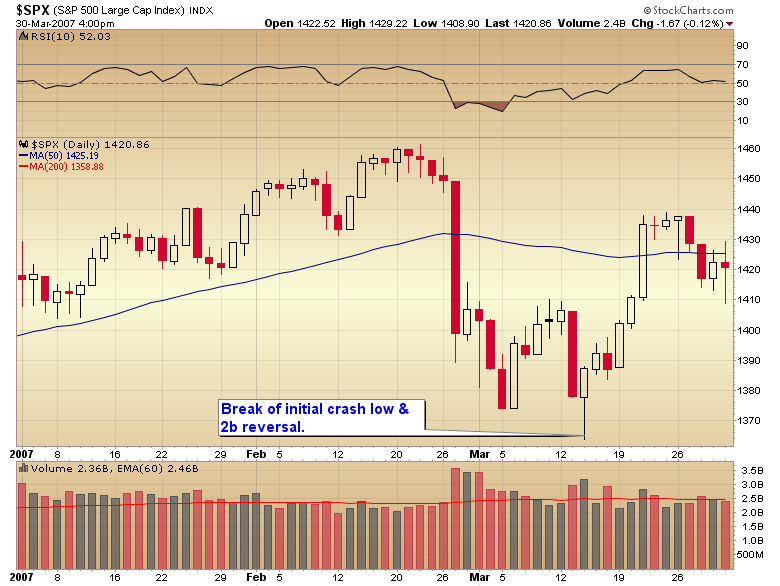 Recently the S&P also broke to lower lows and bottomed with a 2b reversal. Both markets experienced volatile swings as the market put in the intermediate term bottom. Both crashes quickly moved sentiment back to extreme levels of bearishness. In `07 sentiment turned more dour than at any other time during that cyclical bull. At the recent bottom sentiment was blacker than at any time in the last 10 years as measured by a basket of intermediate term sentiment indicators. These kind of extreme sentiment levels are the building blocks for powerful moves. In `07 the extreme bearish sentiment drove the market into a final double top that capped the cyclical bull. If sentiment levels are any indication we should now be set up for at least one more explosive move higher before the fundamentals final overcome this market and drag it back down into the next leg of the secular bear. 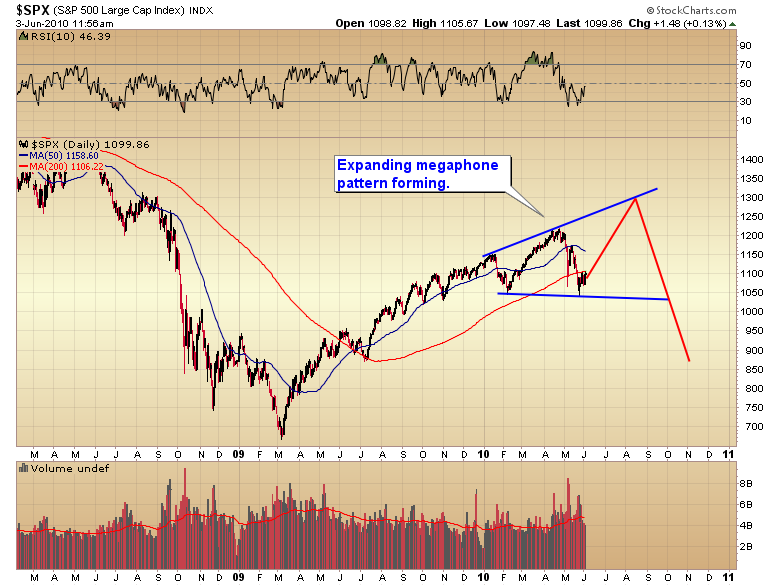 Initial runaway move drives sentiment to extreme bullish levels? Check! Protective put buying dries up leaving the market with no safety net and vulnerable to crash conditions? Check! Test and 2b reversal of the initial crash low? Check! Sentiment depressed to extreme levels of bearishness? Check! Volatile swings back and forth during bottoming process? Check! If history is any indication we should now be on the verge of one more explosive move higher before this cyclical bull expires and heads back down into the next leg of the secular bear. This entry was posted in Uncategorized on June 3, 2010 by Gary.